Balance Inquiry: Check your balance at any BCF store or at www.BurlingtonCoatFactory.com. Further inquiries can be made at (877)-729-1815. 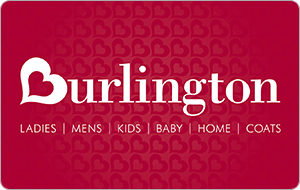 Use of card constitutes acceptance or the following terms and conditions: Card may be used up to its remaining balance to redeem for merchandise and services sold at Burlington Coat Factory, Baby Depot stores, and www.BurlingtonCoatFactory.com. Unless required by law, card is not redeemable for cash, is not valid if altered or illegible, and lost or stolen eCards cannot be replaced. This is not a credit or debit card and has no implied warranties. This card does not expire and there are no associated fees.